Some Sites of the Week (like last week's in Nome) need a lot of narration. But every once in a while, our travels take us to a site that more or less speaks for itself. 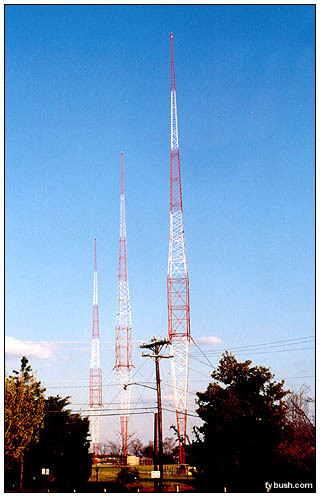 This is WBT (1110 Charlotte), a familiar voice to AM listeners up and down the East Coast all night long - and one of only five remaining U.S. stations using the Blaw-Knox diamond-shaped tower. Fortunately for connoisseurs of the Blaw-Knox diamond tower, WBT resisted whatever temptations might have existed to replace the damaged towers with a more traditional guyed or self-supported version, which means that we have here the last two towers of this style ever to be erected. 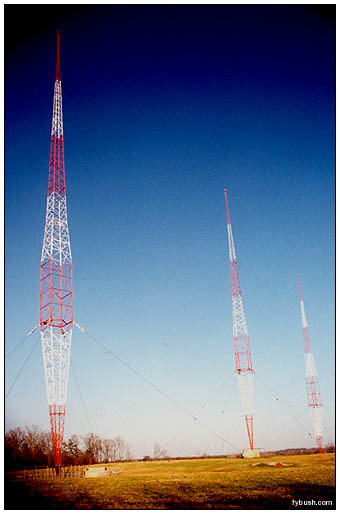 WBT is owned, as it has been for decades, by Jefferson Pilot, one of several insurance companies to have ventured into broadcasting over the years (think WSM and WTIC for a few other notable examples of the genre); its studio address, 1 Julian Price Place, draws its name from a former insurance executive. 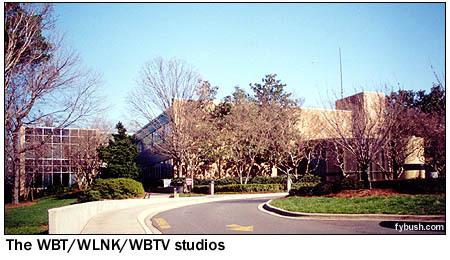 In that handsome building just west of downtown Charlotte are studios for WBT itself, WLNK (107.9, home of the syndicated Bob & Sheri show) and CBS affiliate WBTV (Channel 3). WBT's engineering crew was especially busy the week we visited; the WLNK studio was in the process of being rebuilt, and the engineers had been up very late the night before. So there's no inside look at the transmitter building - but we'll rectify that whenever we get to Charlotte again! 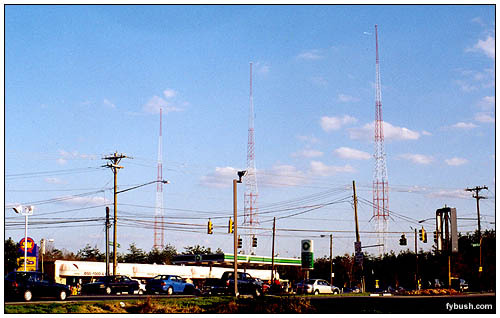 The WBT transmitter site is about 10 miles south of town, not far from the South Carolina border and I-77 on Nations Ford Road in what's now a fairly upscale suburban neighborhood. In any event, the market (as markets are wont to do) began to grow in the seventies, heading right out to the south and west and into WBT's deep null. 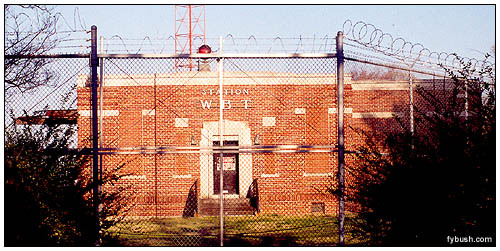 So a few years ago, WBT bought a little class A station called WBZK-FM (99.3) in Chester, S.C. and flipped its calls to WBT-FM. Today, WBT-FM simulcasts WBT all the time, extending the news and talk into those areas that don't get 1110 once the sun goes down. The WBT visit was just the beginning of 10 days on the road this past March, consuming the tower offerings of North Carolina, South Carolina and even a piece of southwestern Virginia; over the next few Tower Sites, we'll look at the rest of Charlotte's towers (though this is a town with only one signal that comes even close to covering the full metro, and you're looking at it) - and then head along to Columbia, Spartanburg-Greenville, Asheville, Greensboro, Winston-Salem, Roanoke, Lynchburg, Raleigh-Durham and all points in between. Stay tuned! A big thank you to Marshall Adams and Bill White of WBT for making this visit possible - especially for taking the time to show your editor around the studio on the very busy day after the war started! Want to see more neat sticks all year round? 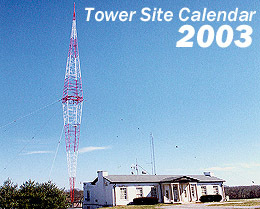 The South's other Blaw-Knox, Nashville's WSM (at left) is one of the more than a dozen Tower Site images featured in the 2003 Tower Site Calendar, still available from Tower Site of the Week and fybush.com.